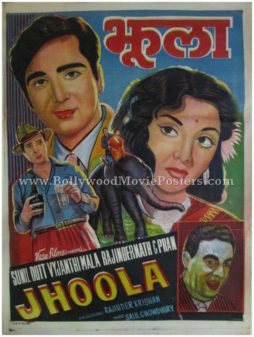 Vintage Bollywood poster for sale of the old Hindi film Jhoola (1962). 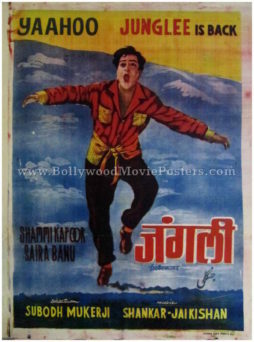 This is an actual surviving vintage Bollywood poster of the 1962 classic Hindi film directed by K. Shankar that starred Vyjayanthimala and Sunil Dutt in lead roles. 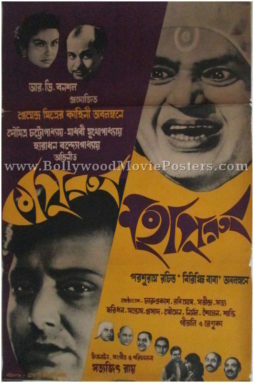 Pran, Rajendra Nath, Achala Sachdev, Mohan Choti and Tun Tun also starred in the film. 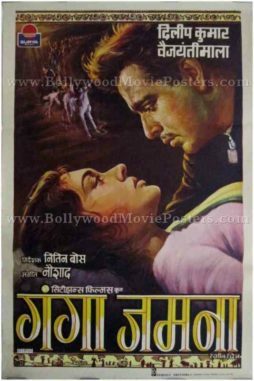 Jhoola was the second collaboration of Vyjayanthimala and Sunil Dutt after the stellar success of Sadhna (1958). 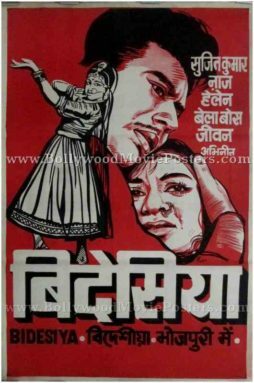 Printed and circulated a few years after the initial first release of the film (somewhere in the 1960s), this vintage Bollywood poster was originally designed for publicity of the film but never ended up being used. 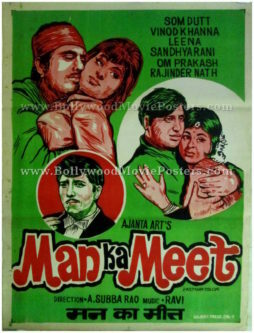 This vintage Bollywood poster was designed by an art studio in Delhi and has a quirky hand painted appearance which is typical of old school Bollywood posters. 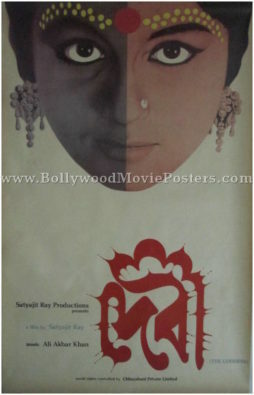 Large hand drawn portraits of Vyjayanthimala and Sunil Dutt are seen prominently in this vintage Bollywood Delhi poster. A couple riding an elephant are seen in the center. 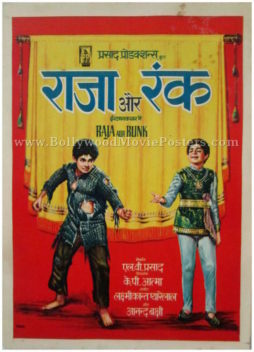 A smaller hand drawn figure of actor Pran holding a whiskey bottle in one hand and a glass in the other is seen on the left hand side of this old Hindi movie poster designed in Delhi. Comedian Rajendra Nath is seen in a hilarious drawing at the bottom. 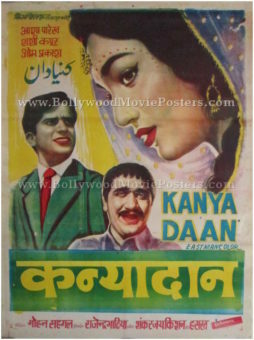 Very rare old Bollywood poster for sale of the historical Hindi film, Jahan Ara (1964). 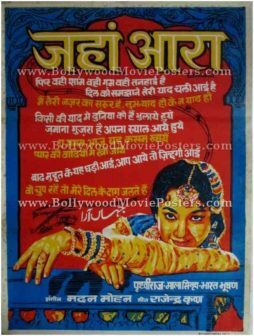 This is an actual surviving old Bollywood poster for sale of the 1964 Hindi film that was based on the life of Jahanara Begum Sahib. Actress Mala Sinha essayed the title role of Jahanara Begum Sahib in the film, with Bharat Bhushan, Shashikala and Prithviraj Kapoor playing supporting characters. Actress Mala Sinha received a Filmfare Best Actress Award nomination for her critically acclaimed performance in Jahan Ara. 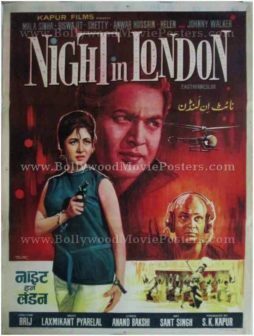 Printed and circulated a few years after the first release run of the film (late 1960s), this very rare old Bollywood poster was designed and printed for publicity of the film but never ended up being used. 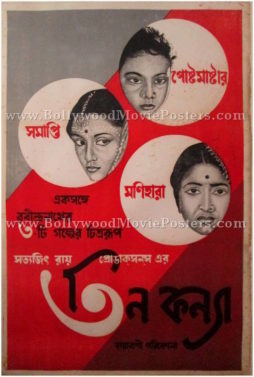 This old Bollywood poster for sale was originally designed in hand painted oil on canvas format by a small time art studio in Kolkata, making it highly collectible. 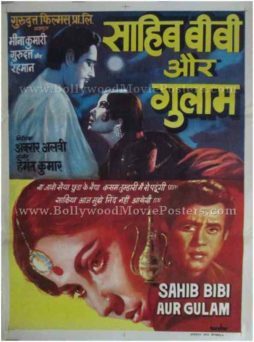 A stunning hand drawn portrait of actress Mala Sinha in all her finery is seen prominently in this old Bollywood poster. 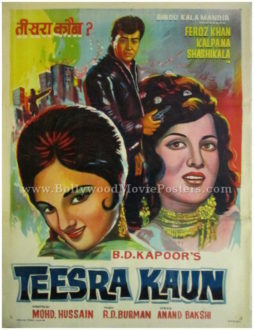 The poster uses an eccentric mix of bright colors such as yellow, red and blue, giving this old Bollywood poster a stunning appearance. 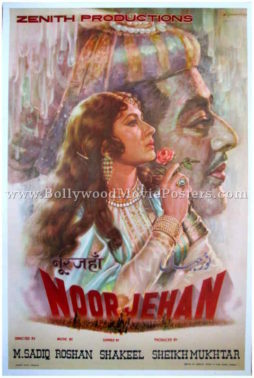 Jahan Ara was a historical drama that featured a stellar soundtrack. 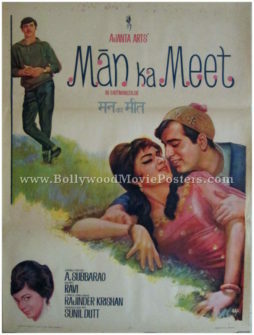 Songs composed by Madan Mohan became instantly popular upon the film’s release. Tracks like “Phir Wohi Sham, Wohi Gham, Wohi Tanhai Hai” and “Main Teri Nazar Ka Suroor Hoon” sung by Talat Mahmood became a rage throughout the nation. 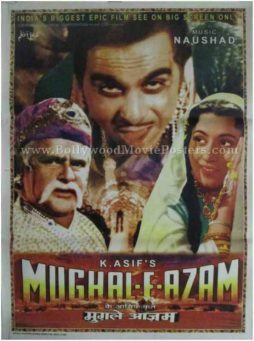 Other notable tracks from the film included, “Kisi Ki Yaad Mein Duniya Ko Hain Bhulaye Huye” and “Baad Muddat Ke Yeh Ghadi” sung by Mohammed Rafi and “Jab Jab Tumhe Bhulaya, Tum Aur Yaad Aaye” sung by Lata Mangeshkar and Asha Bhosle. 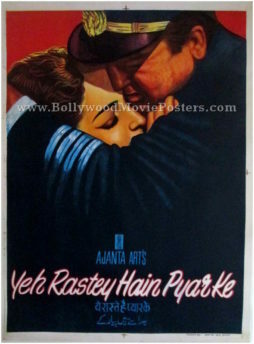 This old Bollywood poster for sale capitalizes on the popularity of the film’s stellar soundtrack by devoting a majority of its design area to text. 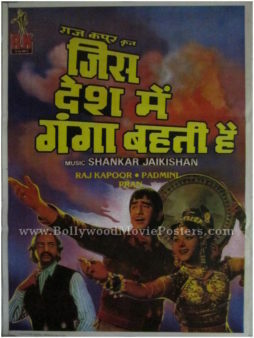 Lyrics from popular songs in the film appear written in Devanagari Hindi juxtaposed with musical notes in this old Bollywood poster for sale. 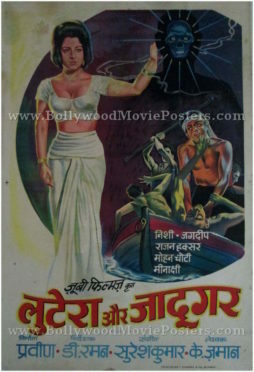 Old Bollywood poster for sale of the blockbuster Hindi film, Gunga Jumna (1961). 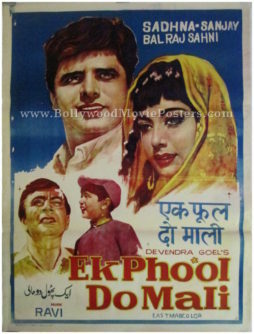 This is an actual surviving original old Bollywood poster for sale of the 1961 film that featured the “Tragedy King” and “Ultimate Method Actor” of Indian cinema, Dilip Kumar in the lead role. 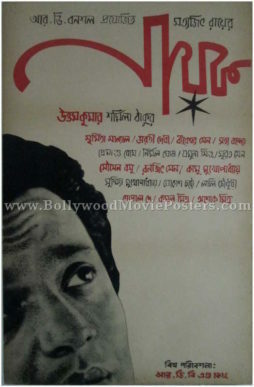 Gunga Jumna was one of the biggest hits of the 1960s and bagged several awards. The film’s unique theme catapulted it to cult status. 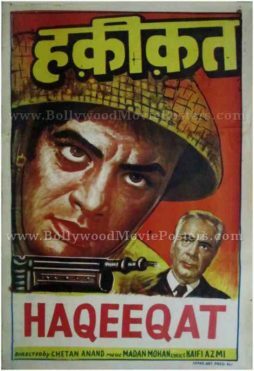 Many sources have ranked Gunga Jumna as a must see film and included it in the top 100 Indian cinema hall of fame, making this old Bollywood poster highly collectible. 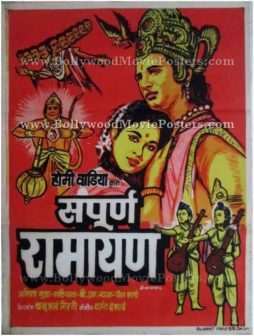 Printed and circulated a decade after the first release of the film (somewhere in the 1970s), this old Bollywood movie poster was originally designed for publicity of the film but never ended up being used. 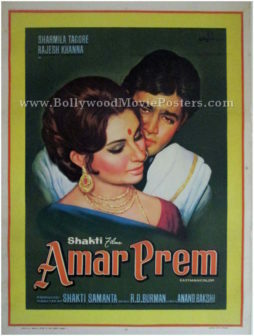 This old Bollywood poster for sale features a stunning hand painted portrait of the lead couple Dilip Kumar and Vyjayanthimala locked in a passionate gaze. 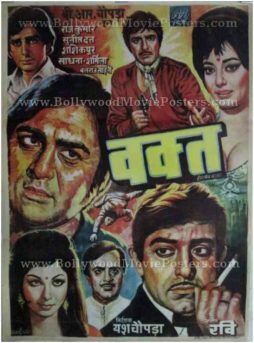 Their hand painted faces appear accentuated with brilliant highlights and visible brush strokes as is typical of old Bollywood posters. 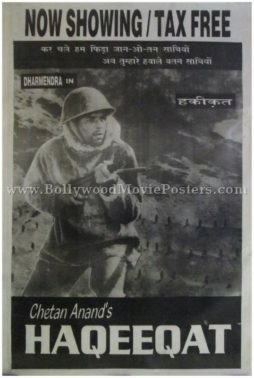 Galloping horses depicting an action scene from the film are seen on the top left of this old Bollywood poster for sale. 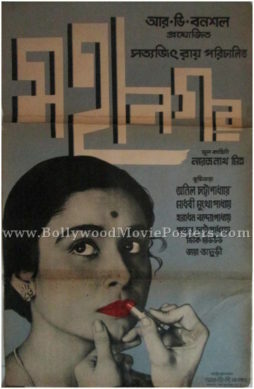 Gunga Jumna is a 1961 Bollywood movie starring Dilip Kumar and Vyjayanthimala in lead roles. The film tells the story of sibling rivalry between two brothers, Gunga and Jumna, who are divided by being on opposite sides of the law. 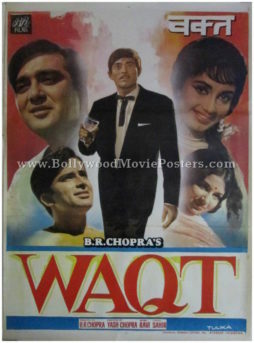 The film’s unique theme catapulted it to cult status and it carried its legacy forward in Bollywood by inspiring several subsequent blockbusters such as the all time classic, Deewaar.